The Hyperfly re-defines Jiu-Jitsu for the next generation of athletes. Staying loyal to its ancient Jiu-Jitsu Japanese philosophy based on sophistication defined by its purest simplicity, the Hyperfly is the perfect GI. The Hyperfly weave is the strongest weave in the world but still the lightest and softest. (If that’s not a bold claim, I don’t know what it is. 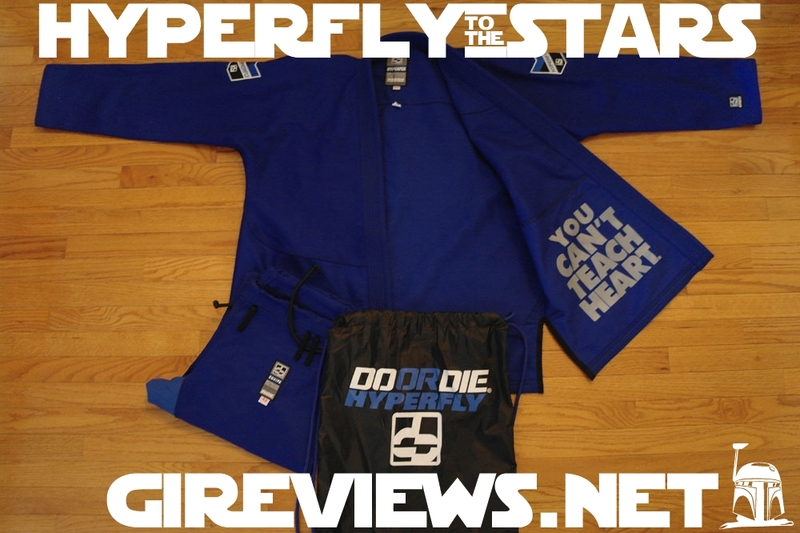 ~Dan) Hyperfly is the future of Jiu-Jitsu and already respected as the perfect gi by BJJ academies across the world. The A3 seems to be perfect for someone around 6’0″. At 5’10″ I didn’t have any issues shrinking the top to my necessary sleeve length . A2 pants would have been a better bet for myself, but i didn’t see about mixing and matching sizes. I had no issues with mobility while wearing this Gi top. The Gi top has atailored fit which is, in my opinion, the best kind of fit. It leaves less for your opponent to grab while still offering great mobility if done right. The pants kind of threw me for a loop when I first took them out of the bag. Theback of the Gi pants is actually about an half inch higher than the front. I’ll have to go back and check my other Gi’s but I think I would have noticed this before. It could be some awesome revolutionary change to Gi pants…but I’m not privy to that information. Regardless, the Gi pants fit well and I had zero issues with them falling down through full drilling and sparring.